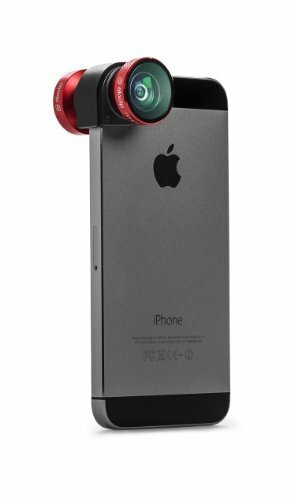 olloclip is a 4-in-1 quick-connect lens for Apple® iPhone. Similarily to a DSLR, the lens is simply slotted onto the iPhone in order to directly change the optical perspetive of your iPhone’s camera. The new 4-in-1 olloclip features fisheye, wide-angle, and a two macro lenses (10x and 15x macro) and is furnished in a nice kit weighing only 28 grams. Change between the fisheye and wide-angle lenses by turning the clip around. Unscrewing the wide-angle or fish-eye lenses reveils the 10x or 15x macro lenses, respectively. The 10x macro lens features a stunning 13 mm focal distance to get very close to the subject; the 15x macro allows for extremely close pictures of your subject. The two macro lenses are cleverly concealed within the olloclip and can be accessed by unscrewing the Wide-Angle or Fisheye lenses that are normally attached to it.